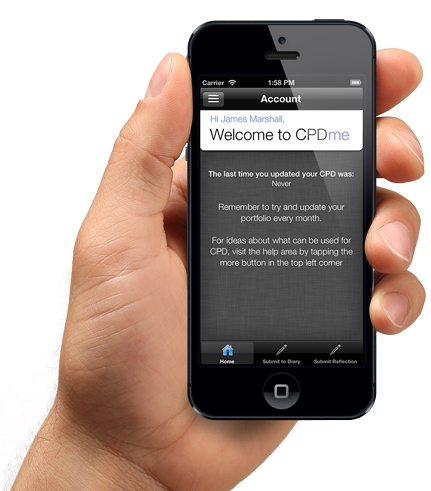 Introducing the new CPDme App! The long awaited app is finally here! Packed with features, and with plans for many more in the future, make sure to get your hands on this app - free for a limited time. The perfect companion for your CPDme membership! 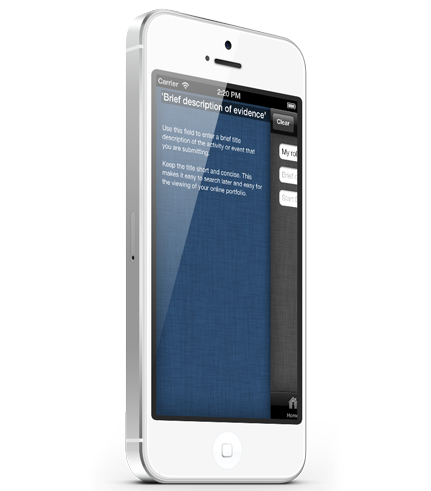 Our new CPD Portfolio app allows you to update your diary and reflections anywhere you are. While you're filling in your submission, tap the '?' icon to see hints and tips on what to fill in. You're never on your own! We wanted to give you the best app possible, so we've packed in the most requested features. Look out for more updates as we go along. This great NEW app will remind you when you last updated your CPD, as well as give tips on what sort of things to document. Have you ever taken part in learning and development but not had any evidence to take home? Material on noticeboards that have informed your practice? Use the camera on your phone to take pictures of evidence and attach this to your CPD diary entry - quick and easy. (Coming Soon) Looking for online courses too? We will have them all here within the app. CPDme have qualified professionals offering support and direction to members around the clock. Another great reason to join CPDme.com. The reason i use CPDme is because I struggled keeping my portfolio upto date, but this makes it a piece of cake. The mobile app will be awesome because I can build my portfolio whilst on the move without having to use my laptop or computer......genius! CPDme enables me to keep my portfolio and cv together all in one place. The mobile app enables me to add new content to my portfolio instantly after completing it with no delay preventing me from forgetting to add it later. @cpdme Not long now until we go live for our second instalment of “Paediatric Myth Busting” with @NWAmb_Paddy. Are you joi… https://t.co/mAUhTnbX8t - 2 hours ago. The aim of CPDme is to provide an affordable easy to use portfolio building and CPD finder service that can be accessed 24/7 on your home or work computer, laptop, iPad, smart phones etc. CPDme is here to compliment the services already provided to you by professional bodies and employers. Click Here to read more.